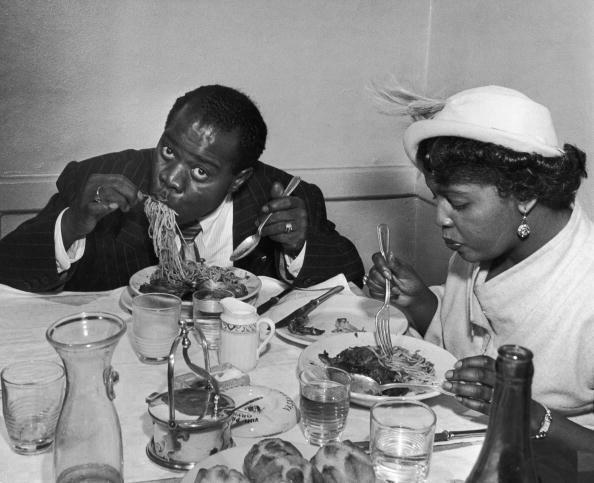 The Culinary Habits Of Louis Armstrong : A Blog Supreme He was arguably the greatest artist of the 20th century. He was also one of its greatest eaters. See the personal red beans and rice recipe of the man behind songs like "Struttin' With Some Barbecue" and "Cornet Chop Suey." Louis Armstrong was arguably the greatest artist of the 20th century. He was also one of its greatest eaters. The man behind "Struttin' With Some Barbecue" so often had grub on his mind that he often worked it into his song lyrics, and occasionally signed his letters "Soul Foodly Yours." More often, the signoff was "Red Beans & Ricely Yours," after his favorite food. We'll get to that in a minute — including his personal recipe for the New Orleans staple. First: For Louis Armstrong's 110th birthday anniversary today, I recently called Ricky Riccardi, archivist at the Louis Armstrong House Museum. Riccardi is also author of the new book What a Wonderful World: The Magic of Louis Armstrong's Later Years and a blog called The Wonderful World of Louis Armstrong. He kindly made some time to chat about the ins and outs of Satchmo's gustatory preferences. "Louis Armstrong was a very earthy human being," Riccardi said. "He got great pleasure out of the simple things: food, women, music. That really sums up the man. And you can't take food out of the equation. It's too simple to say, 'he was just a trumpet player,' or whatever else he is. The man was all about things that brought him pleasure, and food was very near the top of the list." Being from New Orleans, Armstrong's comfort meals were often soul food dishes. But the neighborhood where he grew up also had a significant Chinese population. According to Riccardi, it instilled in him "a lifelong love affair with Chinese food." So much so that while on a tour of Africa in 1961, Armstrong managed to locate the only Chinese restaurant in Nairobi, Kenya. "And he was so tickled by it, he took their menu, he took their business card," Riccardi says. "And we have all that stuff today at the Louis Armstrong House Museum." In the last few decades of his life, Armstrong settled in Corona, in the New York City borough of Queens. The LAHM is based out of his old residence, not far from where a Chinese restaurant called The Dragon Seed used to stand. Armstrong wrote letters about holding court with neighborhood children there. Riccardi was recently reminded of this, when he held a book release party for What a Wonderful World at the LAHM. "I'm signing books in the Armstrong garden, and sure enough, this Asian-American gentleman comes up to me and says, 'Yea, my grandfather owned a Chinese restaurant that Louis loved,'" Riccardi said. "So I said, 'The Dragon Seed?' And he goes, 'Yea!' He was so thrilled I knew about The Dragon Seed. He had copies of the book signed for all his family members." Apart from Chinese food, Armstrong was also a noted fan of Italian pasta. One anecdote has him blaming his overindulgence in spaghetti for a serious medical issue. "One of the major events in his life was when he had a heart attack in Spoleto, Italy in 1959," Riccardi said. "And Louis was never honest — he never admitted it was a heart attack. I guess he knew, or [manager] Joe Glaser knew that would be bad for business. Twenty days later, he was back on the road. "He told people it was just a bad chest cold he got, because the night before, he had a big plate of spaghetti right before he went to bed, and he slept under an open window. And he woke up with a major chest cold that everybody thought was a heart attack. But it wasn't." On the surface, the often-rotund Armstrong doesn't seem like a man concerned about his girth. But Riccardi says his weight fluctuated dramatically over the years. "If there's something he enjoyed doing as much as eating, it was dieting," Riccardi says. "His whole life was a battle of great periods of being graphically overweight, followed by losing 100 pounds and being graphically skinny. That's what he loved to do." Armstrong often employed laxatives and antacids as dietary aids for this purpose. This, too was learned in New Orleans, Riccardi said, when his mother instilled in him the practice of cleansing his system. For years, Armstrong drank a product called Pluto Water, a spring water said to have laxative properties due to its high mineral content. ("Pluto Waterly Yours" was another early letter signoff.) But it wasn't convenient to take with him on the road. And by 1953, Armstrong had ballooned to the heaviest he would be in his life. At the time, a popular dietician named Gayelord Hauser was endorsing a different type of laxative, an herbal product called Swiss Kriss. Armstrong gave it a try, and was hooked. "He said the first time he took Swiss Kriss, he said, 'it sounded like applause,'" Riccardi said. "He said he had to crawl back to the bed when it was over." By 1955, he had lost 100 pounds, which he attributed largely to his regular use of Swiss Kriss and an antacid called Bisma Rex. After he gave interviews on the subject, demand for his dieting regimen was so high that he had it printed on cards to mail back to curious fans. Armstrong would later mail his fans a novelty card with a photo of him sitting on a toilet (framed by a keyhole), headlined by the words "Swiss Krissly" and a sample packet of his favorite laxative. "We have hundreds and hundreds and hundreds of fan letters [at LAHM]," Riccardi said. "And I can't tell you how many are written by housewives that don't even mention jazz. 'Dear Mr. Armstrong, I saw you on television, and I'm writing to request a copy of your diet chart.'" Armstrong was a firm believer in the product through the rest of his life. He once spoke at Stanford University on the subject, and mentioned it when he met President Dwight Eisenhower. 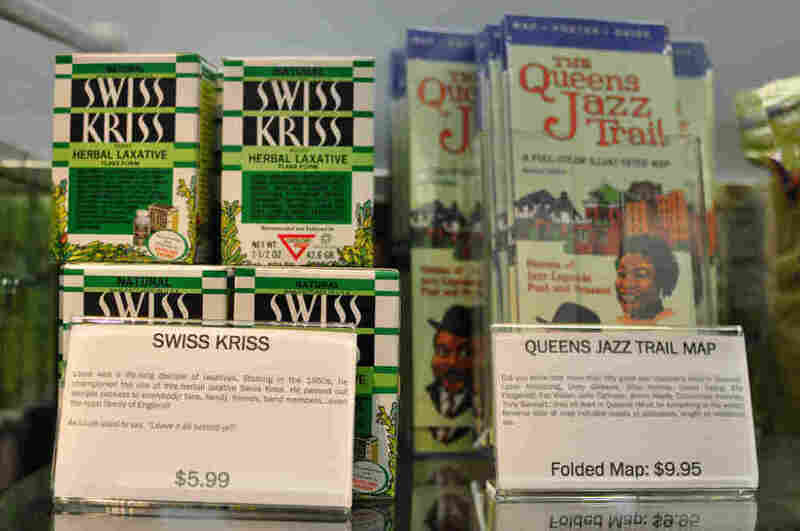 To this day, Swiss Kriss sells out regularly at the LAHM Gift Shop. 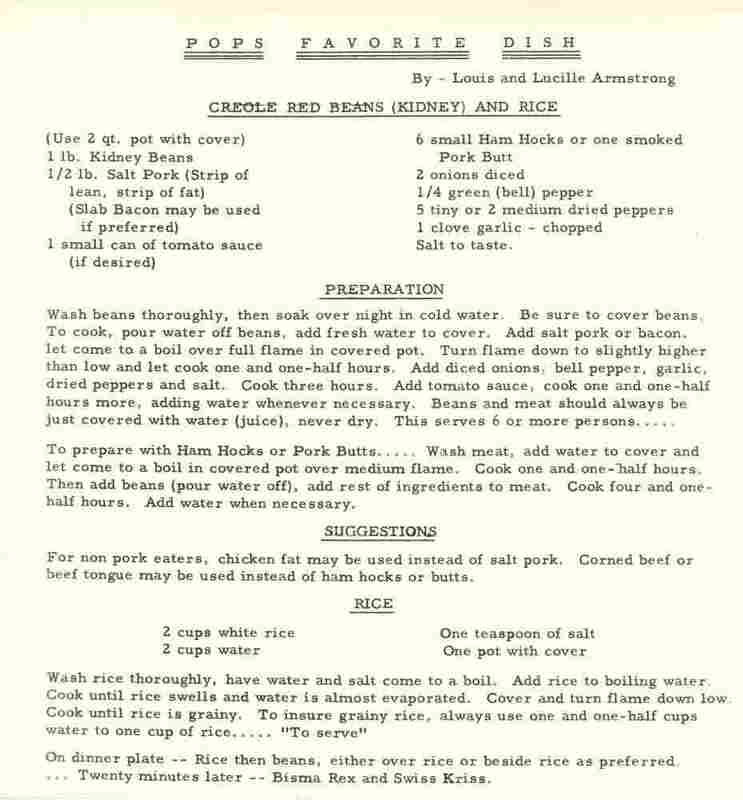 Dietary aids are even mentioned at the end of Louis' personal red beans and rice recipe. "Twenty minutes later — Bisma Rex and Swiss Kriss," he wrote. Armstrong's signature recipe was developed with his fourth wife, Lucille Armstrong. Famously, while courting Lucille in the early 1940s, he asked her to prepare his favorite dish as a litmus test. Being from New Orleans, where red beans and rice is a staple, Satchmo wasn't joking. But Lucille was a northerner, and requested a few days to scramble for a recipe. She invited him to her family's home, and made a big pot. The Red Beans + Rice that Lucille Cooked for me was just what the Doctor ordered. Very much delicious and I Ate Just like a dog. I said forgive me after I had finished eating. I Just had to make some kind of excuse. She accepted it very cheerful. Because I am sure that Lucille has never witnessed any one Human Being eating So much. Especially at one Sitting. I had her to save the rest of the Beans that was left over. Then I'd come another time and finish them. We commenced getting closer "n" closer as time went by. So satisfied was he with her take that when he appeared on The Mike Douglas Show — a daytime television talk show — in 1970, he brought on Lucille for a red beans and rice cooking demonstration. The couple was happily married for nearly three decades, until Louis' death in 1971. Courtesy of the LAHM, here's Louis and Lucille Armstrong's red beans recipe, verbatim. (It's transcribed below.) It's an all-day and all-night process, and vegetarians will have to substitute. But for those who have only known canned beans, an afternoon spent simmering in aromatic vegetables might just prove revelatory. To prepare with Ham Hocks or Pork Butts..... Wash meat, add water to cover and let come to a boil in covered pot over medium flame. Cook one and one-half hours. Then add beans (pour water off), add rest of ingredients to meat. Cook four and one-half hours. Add water when necessary. Wash rice thoroughly, have water and salt come to a boil. Add rice to boiling water. Cook until rice swells and water is almost evaporated. Cover and turn flame down low. Cook until rice is grainy. To insure grainy rice, always use one and one-half cups water to one cup of rice..... "To serve"
On dinner plate — Rice then beans, either over rice or beside rice as preferred. ... Twenty minutes later — Bisma Rex and Swiss Kriss. A condensed version of this story was originally commissioned for the Washington, D.C. based food 'zine The Runcible Spoon. Full disclosure: One of the publication's editors is an NPR employee.